First off: "PDF View Plugin for Jira" is now called "Better PDF Exporter for Jira"! Being a major version, Jira 8 includes a large number of significant changes both in the public API's and in the internals. 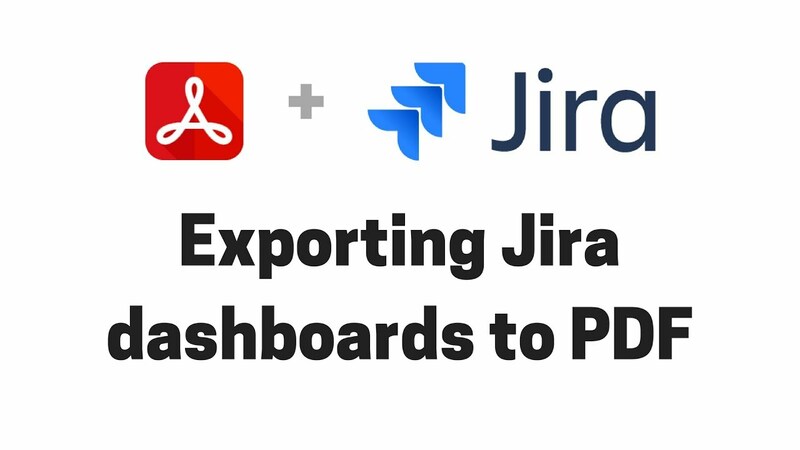 Please note that there are several powerful features in Better PDF Exporter (like exporting Jira dashboards) that could not be implemented without using Jira internals, therefore our app may be affected also by the changes in the internals. Fixed: Gantt chart bars may be missing around week-ends. You need to update two template and two script files. It takes just a minute, follow the guide below. Download the ZIP that contains the latest template files: better-pdf-exporter-for-jira-7.1.0-templates.zip, and extract it. Login to Jira as administrator, go to Administration → Manage apps → PDF Templates (under Better PDF Exporter). Fixed: PDF views are not available on screens of Tempo Timesheets 9. Fixed: Zephyr test steps are not rendered with issue-fo.vm template. You need to update a template and two script files. It takes just a minute, follow the guide below. Download the ZIP that contains the latest template files: better-pdf-exporter-for-jira-6.4.1-templates.zip, and extract it. Login to Jira as administrator, go to Administration → Add-Ons → PDF Templates (under Better PDF Exporter). This release comes with a super-important improvement for the users with non-English characters, with QR codes and barcodes, and with various smaller improvements. Plus, most visibly, the app got a new name! Let us tell a short story about the baby steps of the PDF View Plugin. It all happened between 2008 Christmas and New Year's Eve. The Jira version available in late 2008 already used the word "view" for the functionality that gives a representation of an issue in a certain format. Out of the box, Jira offered web-based, printable, XML and Word views. In addition to the built-in views, an API module type allowed apps (then called "plugins") to implement new views. It is important to note that the Jira API was remarkably well-designed even in those early versions. We at Midori built a new app that gave a customizable PDF representation for issues. We called it simply "PDF view" which was (and still is) just the perfect technical term for this functionality. The app quickly became popular after its first public release in early 2009, but the name was not totally intuitive for many. Some users referred to the app as "PDF viewer" or as "view PDF", mixing the noun "view" with the verb "view". Even worse, some users got confused as they expected the app to be a viewer for PDF type attachments. To fix the situation, we have been planning to use a better name for quite some time, but renaming an established product is never an easy feat. We decided to take this step now, together with rolling out the next version. At the same time, it is also a preparation step for some awesomeness that we hope to release in the next few months. Therefore: bye-bye "PDF View Plugin"! Hello "Better PDF Exporter"! This version introduces the support for the "auto" pseudo font family. The "auto" font family is automatically resolved by the PDF renderer to the concrete font which supports the characters used in that particular PDF document. Therefore, it supports correctly exporting any content written in (nearly) any language in the world! No need to configure fonts, it will just work out of the box. It comes with a price though. Although it is almost invisible, we wanted you to be aware of this. As we wanted to build a 100% self-containing solution which has every resource for this new mechanism to work correctly, the app needs to ship the Truetype font files that contains the plethora of glyphs used throughout the world. These font files are rather large in size and increase the file size of our app from the previous ~20.3 to ~75.8 megabytes, unfortunately. That's a significant jump, so we looked into various solution to reduce this. We considered implementing an auto-downloading mechanism, but it is not guaranteed that the Jira server has access to the public Internet. We considered implementing an auxiliary app which carries the TTF files, but it wouldn't allow the mechanism to work out of the box, would be complicated and error-prone. So, for now, we just ship the TTF files in the app. At the end of the day, the only real difference is that downloading the app will take 3 times longer, which is insignificant considering the current speed of the Internet. We even wrote a tutorial dedicated to fonts: learn more about using fonts. From this app version you can generate every type of linear (1D) and matrix (2D) barcodes to your PDF documents. It includes the ubiquitous QR code, the frequently used UPC (Universal Product Code) or EAN-13 (European Article Numbering) product codes among others. You can use this feature to add scannable links, email addresses, geographic locations or product info to your documents. Learn more about using QR codes and barcodes. Generating large documents from a large number of issues can be resource intensive: it may use lots of CPU and lots of memory. Although both types of resource will be released immediately after the document is rendered, it may temporarily put significant load on the Jira server. Plus, if you run multiple renderings in the same time (concurrently), their load adds up. To help control the total load, it is possible to limit the number of parallel renderings from this app version. The $linkTypeNames variable in traceability-matrix-fo.vm was updated to recognize all current link type names as a traceable dependency between issues. All Groovy scripts were converted to use Apache Commons Lang 3 (i.e to import classes from the org.apache.commons.lang3 package instead of org.apache.commons.lang). We suggest importing org.apache.commons.lang3 also in custom-developed scripts, although org.apache.commons.lang continues to work. Lots of work of have been done: most templates were updated, a new script and 3 new views were added. Follow the guide below to bring all your resources to the most current revision. Download the ZIP that contains the latest template files: better-pdf-exporter-for-jira-6.4.0-templates.zip, and extract it. Open the issue-fo.vm template file from the directory where you extracted the ZIP. If you haven't made any changes in the original issue-fo.vm file, then just copy-paste the content of the new template (the one you just downloaded) to the editor, save it and you are done. If you made changes to the original issue-fo.vm, you will need to migrate those to the new template. This should be done by comparing the content your current issue-fo.vm file with the new one, and merging all changes you made in the former to the latter. Use a visual merge tool (like WinMerge or Eclipse's compare and merge editor), and it should be trivial. From the unzipped files, open the barcode-tool.groovy script file. In Jira, click the New resource button under the PDF Templates list. Enter barcode-tool.groovy as file name, copy the file's content to the editor and save it. Check if the new file has appeared in the template list. Enter "PDF (QR code)" as name. Check the Single Issue View, Issue Navigator, Board (in Jira Software), Backlog (in Jira Software), Service Desk (in Jira Service Desk), Tempo Timesheet contexts. Select the template file issue-fo.vm. Move the new view up, right after the "PDF" view (2nd position). Enter "Issue List + QR Code (PDF)" as name. Select the template file issue-navigator-fo.vm. Move the new view up, right after the "Issue List (PDF)" view. Enter "Story Card + QR Code (PDF)" as name. Check the Single Issue View, Issue Navigator, Board (in Jira Software), Backlog (in Jira Software) contexts. Select the template file story-card-fo.vm. Move the new view up, right after the "Story Card (PDF)" view. Go to an issue and test if the "PDF (QR Code)" and the "Story Card + QR Code (PDF)" options in the Export dropdown are exporting the QR code as expected. Also test if reading the QR code with your smartphone works. If you activated the "Issue List + QR Code (PDF)" view above, go to the Issue Navigator and test if that option in the Export dropdown is exporting the QR code. Go to an issue and edit its description by adding Asian or Cyrillic characters. Test if exporting this (with any PDF option in the Export dropdown) correctly displays those characters in the resulted PDF. This release brings valuable improvements to the popular Tempo to PDF timesheet and invoice export feature. It also improves the support for saved filters in automation actions via PDF Automation Plugin 3.1.0 (released the previous day). If you are not using that yet, make sure to give this a try! It will save you from lots of boring manual work by creating and distributing PDF documents automatically. In its latest version PDF Automation Plugin has improved support for saved filters. Learn more in the PDF Automation Plugin 3.1.0 release notes. You need to update some of the existing resources and add a new script file. It takes just a few minutes, follow the guide below. Download the ZIP that contains the latest template files: jira-pdfview-plugin-6.2.0-templates.zip, and extract it. Login to Jira as administrator, go to Administration → Add-Ons → PDF Templates (under PDF Views). From the unzipped files, open the issue-navigator-tool.groovy script file. In Jira, click the New resource button under the PDF Templates list. Enter issue-navigator-tool.groovy as file name, copy the file's content to the editor and save it. Fixed: a NullPointerException is thrown in rare cases when exporting the Burndown Chart gadget. This version is simply a compatibility release for Jira 7.7.0. The default templates were modified not to export the "Development" field, as we don't see lots of value in exporting that custom field type. If you disagree, please let us know and we will change our position! Download the ZIP that contains the latest template files: jira-pdfview-plugin-6.1.0-templates.zip, and extract it. Repeat the previous step also for issue-navigator-fo.vm. This major release focuses on significantly improving dashboard exports. Most importantly, this version enables exporting four new gadget types, making PDF View Plugin the only viable gadget exporter solution for Jira (see the list of all supported gadgets). For this, we completely re-worked the existing gadget export mechanism. The new mechanism will also allow us to add support for further gadget types in future releases. Additionally, this version brings various configuration and layout improvements to the PDF template which is used to export dashboards (intuitively named dashboard-fo.vm). See some dashboard export samples generated from Jira core gadgets. See some dashboard export samples generated from Jira Software gadgets. The dashboard export template (dashboard-fo.vm) shipped in previous app versions exported your gadgets to a trivial A3-sized "each gadget stretches to the full page width" layout. Although it was perfectly possible to change that layout to multiple columns and different page geometries (let me repeat: anything is customizable with this app! ), we made it easier and more intelligent. Learn more about configuring the layout for dashboard exports. Learn more about customizing column count and paper sizes in dashboard exports. The dashboards and gadgets tutorial was rewritten to include the latest changes. Gadget headers are now exported with the color they use in the web interface (can be turned off to save ink when printing). The numbers in the Two Dimensional Filter Statistics Gadget are now exported as clickable links. Average Age Gadget also exports the "Period: last 30 days (grouped Daily)" summary line. Created vs. Resolved Gadget also exports the "Issues: 26 created and 29 resolved Period: last 90 days (grouped Daily)" summary line. Pie Chart Gadget exports also exports the "Status, Total Issues: 51" summary line. Recently Created Gadget also exports the "Total Issues: 51, Period: last 365 days (grouped Monthly)" summary line. Resolution Time Gadget also exports the "Period: last 30 days (grouped Daily)" summary line. Time Since Gadget also exports the "Period: last 62 days (grouped Weekly)" summary line. Fixed: dashboard exports generated by automation actions have the filename generated from the dashboard ID instead of the dashboard name ("10103.pdf" instead of "My Favourite Dashboard.pdf"). Fixed: character encoding in Tempo worklog comments and Zephyr test data (that use international characters) may break when exporting from Jira instances hosted on Windows. You need to update some of the existing templates and script files, and also create two views for the new dashboard export layout options. It takes just 2 minutes, follow the guide below. Download the ZIP that contains the latest template files: jira-pdfview-plugin-6.0.1-templates.zip, and extract it. Open the dashboard-details-fo.vm template file from the directory where you extracted the ZIP. If you haven't made any changes in the original dashboard-details-fo.vm file, then just copy-paste the content of the new template (the one you just downloaded) to the editor, save it and you are done. If you made changes to the original dashboard-details-fo.vm, you will need to migrate those to the new template. This should be done by comparing the content your current dashboard-details-fo.vm file with the new one, and merging all changes you made in the former to the latter. Use a visual merge tool (like WinMerge or Eclipse's compare and merge editor) and it should be trivial. To create a new export option in the Export dropdown at dashboards, go to PDF Views (in the left-side bar) and click Add a new view. Enter "Export Dashboard to PDF (2 columns)" as name, check the Dashboard context option, select the template file dashboard-fo.vm and click submit. Click Add a new view again. Enter "Export Dashboard to PDF (3 columns)" as name, check the Dashboard context option, select the template file dashboard-fo.vm and click submit. Go to a dashboard, and test if the three "Export Dashboard to PDF" options in the Export dropdown are working as expected. The nFeed app integrates external data sources (SQL databases, LDAP, Active Directory, REST APIs, Salesforce, CSV files, etc.) to Jira. From this version, PDF View Plugin is tightly integrated with nFeed, allowing you to export all nFeed custom fields to PDF. More than data export, you can easily implement custom reporting and Business Intelligence on nFeed data. We compiled a page about what to do and what to avoid when developing custom PDF templates for large scale of data. If you are working with many-many-thousands of issues or many-many-thousands of fields or complicated Groovy scripts, bring a cup of coffee and read the Performance tuning page. We will keep improving it with our future findings, as well. We updated the "getting started" page in the app to save some reading for first time evaluators. As it may be useful even for more experienced users, it can also be visited via the link at Administration → Add-Ons → Getting Started (under PDF Views). You need to update some of the existing templates and add a new script file. It takes just 2 minutes, follow the guide below. Download the ZIP that contains the latest template files: jira-pdfview-plugin-5.10.0-templates.zip, and extract it. From the unzipped files, open the nfeed-tool.groovy script file. In Jira, click the New resource button under the PDF Templates list. Enter nfeed-tool.groovy as file name, copy the file's content to the editor and save it. Insight is the leading asset management app for Jira, that allows implementing CMDB, CRM, HR, ITSM or ITIL functionality on the Jira platform. From this release, PDF View Plugin is tightly integrated with Insight, allowing you to export all Insight custom fields with the desired granularity (object keys, names, and attributes) to PDF. Having full access to Insight objects and their attributes, you can easily implement custom reporting and Business Intelligence on Insight data. Please note that Service Desk is using many other custom fields that are based on standard Jira custom field types. For instance, Approvers is a "User Picker (multiple users)" type custom field, while Operational categorization is "Select List (cascading)". Being standard types, those are supported out of the box. Overall, this release makes our Service Desk compatibility 100% complete. The template issue-fo.vm exports resolution date (together with creation date, update date and due date). Table-heavy templates like "issue-navigator-fo.vm" and "traceability-matrix-fo.vm" have nicer table borders without visual artifacts (also see this hint). PDF documents generated from issues: "issue key" (for single issues), "search request name" (for saved filters with a name), "PDF view name (Jira title)" in this order of precedence. PDF documents generated from dashboards: "dashboard name" (for dashboards with a name), "view name (Jira title)" in this order of precedence. We made major updates on the PDF templates and the Groovy scripts. You can take advantage of all the performance improvements by precisely executing the following steps. Download the ZIP that contains the latest template files: jira-pdfview-plugin-5.9.0-templates.zip, and extract it. Open the burn-down-chart-fo.vm template file from the directory where you extracted the ZIP. If you haven't made any changes in the original burn-down-chart-fo.vm file, then just copy-paste the content of the new template (the one you just downloaded) to the editor, save it and you are done. If you made changes to the original burn-down-chart-fo.vm, you will need to migrate those to the new template. This should be done by comparing the content your current burn-down-chart-fo.vm file with the new one, and merging all changes you made in the former to the latter. Use a visual merge tool (like WinMerge or Eclipse's compare and merge editor), and it should be trivial. From the unzipped files, open the insight-tool.groovy script file. In Jira, click the New resource button under the PDF Templates list. Enter insight-tool.groovy as file name, copy the file's content to the editor and save it. Repeat the previous step also for the service-desk-tool.groovy file. This version is simply a compatibility release for Jira 7.4.0. This version is a maintenance release to deliver an important bugfix to PDF View Plugin. This version fixes the problem of the #cfValue() and other Velocity macros not rendering randomly: at some exports (including both manual and automated ones), they appear in the PDF document in their original form. 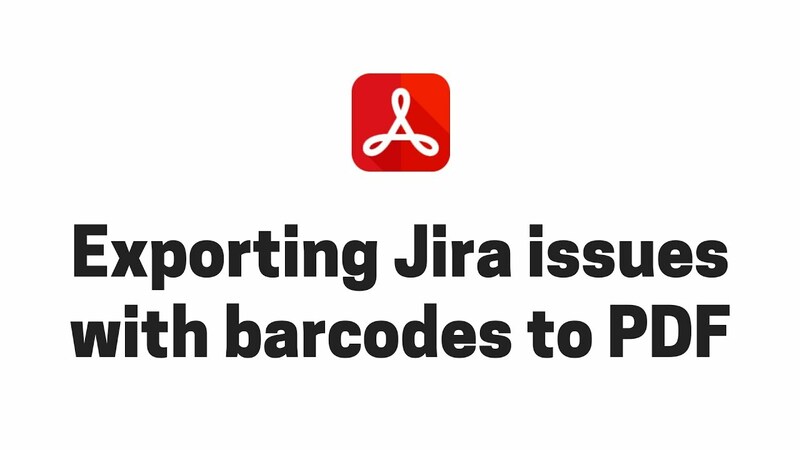 Root cause: there is a potential race condition in Jira's internal macro caching, that we could successfully reproduce with a Python script that simulates rendering PDF documents while generating unusual load also on the Jira web interface. Fix: although the problem is not in the PDF View Plugin side, we managed to develop a fix for this. This version is primarily a compatibility release for the Jira 7.3 line. Previous PDF View Plugin versions used the concept of view types. The multiple issues view type, for example, offered the PDF view for any screen that worked with multiple issues, including Issue Navigator, Jira Agile backlog or Jira Service Desk queue among others. You can set any combination of these so-called view contexts for each PDF view. Combining this with the optional restrictions (limit each view to certain users, to certain user groups, to certain issues), you can flexibly configure all your Export menus. The next release of our Excel exporter Jira app also introduces view contexts. This PDF View Plugin version is also a compatibility release for that. Because the PDF View Plugin can now export so many different types of information, from field values, through attachments, diagrams, worklogs, comments, etc. to test executions, the default template started to become a little unstructured. You need to update some of the existing templates and script files. It takes just 2 minutes, follow the guide below. Extract the ZIP and open the issue-fo.vm template file. Login to Jira as administrator, go to Administration → Add-Ons → PDF Templates (under PDF Views) and open your current issue-fo.vm file. Repeat the previous steps also for gliffy-tool.groovy. From the unzipped files, open the zephyr-tool.groovy script file. In Jira, click the New resource button under the PDF Templates list. Enter zephyr-tool.groovy as file name, copy the file's content to the editor and save it. Turn on the export for Zephyr tests if you are using Zephyr. Upgrading to this version is recommended if you want to export Zephyr test data, or want to enjoy better structured default exports. You can export the high resolution Gliffy diagrams that illustrate your issues to PDF documents. Gliffy diagrams will be core part of your issue exports, just like image attachments. Repeat the previous steps also for tempo-tool.groovy. From the unzipped files, open the gliffy-tool.groovy script file. In Jira, click the New resource button under the PDF Templates list. Enter gliffy-tool.groovy as file name, copy the file's content to the editor and save it. Turn on the export for Gliffy diagrams if you are using Gliffy. Upgrading to this version is recommended if you want to enhance your exports with Gliffy diagrams, or create view names with non-English characters. Using embedded SVG is a powerful and simple way to add dynamic vector graphics to your PDF documents. This can be utilized to solve a plethora of problems, from rotating text, drawing lines, to enhancing your documents with geometric shapes. You need to update some of the existing templates and script files. It takes just 5 minutes, follow the guide below. Extract the ZIP and open the gantt-chart-fo.vm template file. Login to Jira as administrator, go to Administration → Add-Ons → PDF Templates (under PDF Views) and open your current gantt-chart-fo.vm file. If you haven't made any changes in the original gantt-chart-fo.vm file, then just copy-paste the content of the new template (the one you just downloaded) to the editor, save it and you are done. If you made changes to the original gantt-chart-fo.vm, you will need to migrate those to the new template. This should be done by comparing the content your current gantt-chart-fo.vm file with the new one, and merging all changes you made in the former to the latter. Use a visual merge tool (like WinMerge or Eclipse's compare and merge editor), and it should be trivial. Repeat the previous steps also for issue-fo.vm. Repeat the previous steps also for issue-navigator-fo.vm. Repeat the previous steps also for project-report-fo.vm. Repeat the previous steps also for project-report-fo.groovy. Repeat the previous steps also for release-notes-fo.vm. Repeat the previous steps also for requirements-specification-fo.vm. Repeat the previous steps also for sales-report.groovy. Repeat the previous steps also for story-card-fo.vm. Repeat the previous steps also for timesheet-fo.vm. Upgrading to this version is recommended if you want to use SVG graphics, display avatars and leverage the template enhancements above. The robustness of the exported logic was vastly improved to deal with unexpected HTML and XML. It can handle unknown elements, unknown attributes, unknown CSS styling, and every sort of syntax errors. If you are maintaining or migrating field values in HTML, this will save you lots of headache. Want to export field X of object Y? Use this new template both as cheatsheet and as testing environment. You need to update some existing templates and script files. It takes just 5 minutes, follow the guide below. Upgrading to this version is recommended if you want to make large exports or you have lots of inconsistent HTML values in text type fields (Environment, Description, single- and multi line custom fields). This version supports Jira Data Center (clustered Jira deployments) and licensing via Atlassian Marketplace. In a clustered Jira environment, all configuration including PDF templates, Groovy scripts and other resources are transparently replicated among the nodes by the app. When exporting, you can access any random node in the cluster to get your PDF document. Therefore, the app fully supports Jira enterprise deployments. Starting from this release, app licenses can be purchased, renewed and co-termed via Atlassian Marketplace. First update your app using UPM (the app manager built in to Jira). Then, assuming that you have an existing license for the app, start the license migration procedure. Upgrading to this version is necessary if you want to use the app with Jira Data Center or you want to enjoy the advantages of Atlassian Marketplace licensing. This version is simply a compatibility release for the Jira 7 line, while also maintaining compatibility with Jira 6.4. Upgrading to this version is necessary if you want to use the app with Jira 7. This version enables to configure visibility rules for the views, to show or hide them dynamically for user, groups and issues. The PDF View Plugin now also seamlessly integrates with the user interface of the most widely used Jira apps, like Jira Agile, Jira Service Desk and Tempo. You can set restrictions on where and for who the views should be enabled. Now it's easy to show only those export items in the "Export" menus	that really make sense in that context. Per-user and per-group settings might also come handy. All templates were reviewed to protect against rendering errors, when an empty issue list is passed for the renderer. Albeit it should never happen and is considered a bug in Jira, it did happen in certain circumstances. Also, the issue-fo template supports a new configuration parameter $excludedCustomFieldTypeKeys. As its name suggests, it allows you to list the type keys of those custom fields you want to exclude from exports. It defaults to the keys of the lexo-rank and legacy-rank custom fields managed by Jira Agile, because those are not generating human-readable output. You need to update some existing templates and script files, plus create one new Groovy script. It takes just 5 minutes, follow the guide below. Repeat the previous steps also for project-report.groovy. From the unzipped files, open the requirements-specification.groovy script file. In Jira, click the New resource button under the PDF Templates list. Enter requirements-specification.groovy as file name, copy the file's content to the editor and save it. Upgrading to this version is necessary if you want to configure visibility for views, or want to export PDF documents from Jira Agile, Jira Service Desk or Tempo. This version is simply a compatibility release for the Jira 6.4 line. Upgrading to this version is necessary if you want to use the app with Jira 6.4. This version enables to export, print and share Jira dashboards and reports. Combining this with the PDF automation capabilities gives a powerful tool to anyone's hands who's looking for automatic Jira reporting. It's not you opening your browser for reports anymore, but the reports coming to your mailbox automagically. You can export the most important reporting gadgets to PDF documents that you can customize to their smallest details. You need to create two new templates, plus the two views that render those templates. It takes for just 2 minutes, follow the guide below. Extract the ZIP and open the dashboard-fo.vm template file in any plain text editor. Login to Jira as administrator, go to Administration → Add-Ons → PDF Templates (under PDF Views) and click Add a new resource. Enter dashboard-fo.vm as filename, and copy the template's content from the desktop editor to the browser's editor, then save it. Please note that you need to paste to the editor box at the bottom, not to the one right under the filename (which is used for the file description). Repeat the previous steps also for dashboard-details-fo.vm. Login to Jira as administrator, go to Administration → Add-Ons → PDF Views (under PDF Views) and click Add a new view. Enter "Export Dashboard to PDF" as name, select "Dashboard only" as type, select dashboard-fo.vm as template, and save it. Repeat the previous steps for another view called "Export Dashboard Details (PDF)". For this select "Disabled" as type and select dashboard-details-fo.vm as template. Why to disable it? It serves as a helper tool that is only used when developing a custom PDF template for dashboards. You will not need it most of the time, but need to enable it to figure out dashboard IDs or gadget IDs when customizing templates. Go to one of your dashboards that use gadgets supported by the PDF View Plugin for Jira, open the Tools menu and click Export Dashboard to PDF. 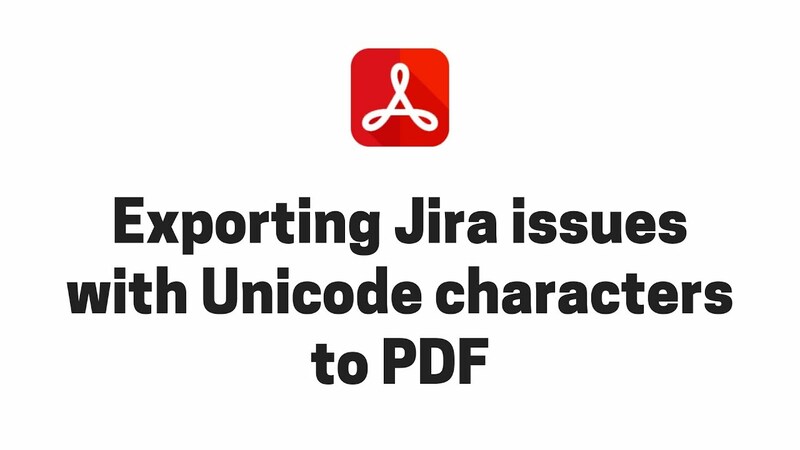 Upgrading to this version is necessary if you want to export Jira reports and dashboards to PDF. This version focuses on integrating the PDF exporting capabilities better with the most widely used Jira apps. You can export Tempo custom fields (Account, Team, Iteration) and Tempo worklogs to PDF. This version has also updated the timesheet-fo.vm template to allow generating professional timesheets and invoices from Tempo data. You can export Jira Service Desk custom field (SLA's, Customer Request Type) to PDF. You can export any Table Grid Editor managed custom field (tables, lists) to PDF. Remote links are exported into a new section in the issue-fo.vm template. They will appear in the default "PDF" and "PDF (All fields)" exports. Due to the changed templates, upgrading is a little more work than upgrading the app itself only. You will need to update 3 existing templates and create a new Groovy script, just follow the guide below. You have already unzipped the most current resource files, so open the file tempo-tool.groovy. In the browser, click the New resource button under the PDF Templates list. Enter tempo-tool.groovy as file name, copy the file's content to the editor and save it. Check if the new file is correctly appeared in the list. Upgrading to this version is necessary if you want to take advantage of the new integrations and remote link exporting. This version comes with many improvements, including the support for JEditor rendered fields, Jira Agile custom fields, performance enhancements and major updates to the 2 most important templates. This was the single most requested item in our public feature request forum. From this app version, PDF exports will preserve the formatting of all JEditor-rendered fields, including Environment, Description, comments, single- and multi-line text custom fields. This version also introduces proper export for the Jira Agile-specific custom field types, "Sprint" and "Epic". It was added to the issue-fo.vm and the issue-navigator-fo.vm templates, so you will need to upgrade the template's code, as well. Please see the "Upgrading" section below for more details. We also worked hard on making the bulk exports faster. Many users reported that their PDF export requests timed out when trying to bulk-export 800, 1000 or more issues (typically resulting in several hunded page long PDF documents). With this version, you can export large number of issues 30-40 times faster! What took for long minutes previously, will be completed in 5-20 seconds now. The new default mode will export only those custom fields that are visible in the current Issue Details screen configuration. It allows showing, hiding, re-ordering custom fields and grouping them to tabs (which appear as separate sub-sections) in the PDF documents. At the same time, we do not export the issue's field change history when using this mode (you can, as always, easily change it in the template). The All mode, as its name suggests, exports all custom fields that has non-blank value. Plus, it also exports the field change history. Please note that it has been the default behaviour until this version, but the user feedback convinced us to change it. If you want to continue with the old-style behaviour, you can easily do that by setting the $exportAllCustomFields variable to "true", as written in the "Upgrading" section below. Fixes in international texts: some field names and values were exported in English, even if the user had a different language setting activated. Now fixed! $exportAllCustomFields: set to "true" to export all custom fields, or to "false" to export only the visible ones. $excludedCustomFieldIds: comma separated list the ID's of the custom fields to be excluded from the export, e.g. : [10001, 10015]. $exportChangeHistory: set to "true" to export the issue field change history. $fieldScreenRendererFactory: allows you to obtain field screen renderers, to check which custom fields are added to what screens and tabs. $fieldViewManager: checks whether a custom field is visible for an issue. $workRatio: calculates Jira's special "work ratio" metric. $dateTimeFormatter: is Jira's built-in date formatter. $date: supports standard Java date formatting patterns for flexible date formatting. Please read their detailed description in the template development documentation. We added a "getting started" page to save some reading for first time evaluators. As it may be useful even for more experienced users, it can also be visited via the link at Administration → Add-Ons → Getting Started (under PDF Views). Due to all these changes, upgrading is a little more work than upgrading the app itself only. Repeat these upgrade steps also for the issue-navigator-fo.vm template file. If you already have a view called "PDF", then leave it there. Add a new view, called "PDF (All fields)" which renders the issue-fo.vm template. Explanation: the latest template checks if the view's name contains the "All" string, and switches to the second mode if it does. As mentioned previously, the behaviour of the default template has slightly changed. According to the new default, only the visible custom fields will be exported (not everything, as previously). Also, the issue field change history will not be exported. If you want to return to the old behavior, simply set the $exportAllCustomFields and $exportChangeHistory configuration variables in issue-fo.vm to "true". Upgrading to this version is necessary if you want to take advantage of the new features and performance improvements. This version is simply a compatibility release for the Jira 6.3 line. Upgrading to this version is necessary if you want to use the app with Jira 6.3. This version introduces a public PDF API to generate PDF documents from Jira issues and other Jira data. Install and configure the free open source post function- and service scripts to your Jira. Automate your processes with the powerful Jira Automation Plugin. Write your custom Groovy scripts, and run them with the ScriptRunner Plugin. 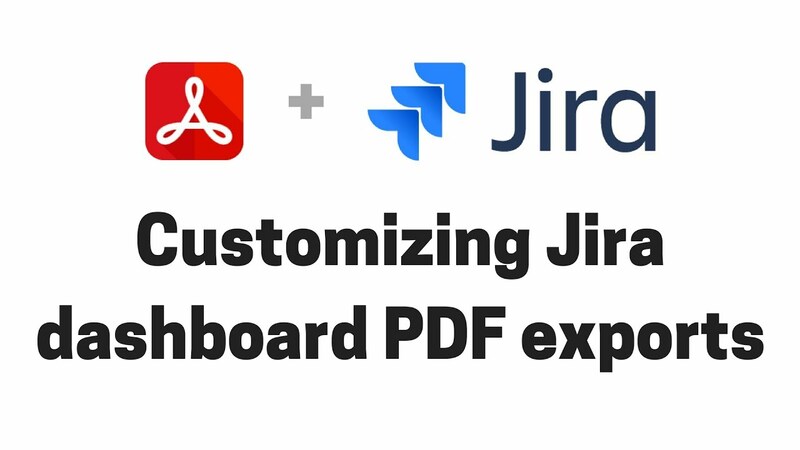 Build your own Jira apps in Java, or integrate PDF exporting capabilities to your existing apps. Upgrading to this version is necessary if you want to utilize the new PDF API in any way. Export types, which appear in the "Export" dropdown menus, can be fully managed in the Jira web UI. You can add, update or delete export types, enable them for single issues or multiple issues (Issue Navigator), and select which export type renders which template. We also made a major review on all templates, most importantly: Gantt Chart, Burn Down Chart, and Project Status Report. How to recreate your old configuration? It's easy. Go to Administration → Add-ons → PDF Views. Create your custom views and configure them for single or multiple issues (trivial). IMPORTANT: you only have to do this once, and your new setup will be saved to the Jira database. Future app upgrades will preserve it. While configuring the views, we encourage you to try all templates by enabling the initially disabled views. After you carefully evaluated all, disable the ones that you don't need at the moment. Upgrading to this version is highly recommended if you use multiple export types, and you implemented that by modifying the app JAR previously. Upgrading to this version is necessary if you use Jira 6.0. A conflict between the PDF View (this app) and the Create and Link (by Customware) apps. It resulted partly broken license configuration screens on systems where both apps were installed. An unlikely servlet-filter mapping issue. It was reported by a customer with a complex network topology environment, which effectively rewrote URLs used by the app. Better (re)use of Velocity contexts and resources during PDF rendering. This is our biggest release since the first public version. The app is dead simple to install and upgrade dynamically through the Universal Plugin Manager (UPM). UPM is the standard tool built into Jira for installing, managing, upgrading, and diagnosing apps. The app doesn't use files from the Jira server's filesystem any longer. All those resources (PDF templates, Groovy scripts, configuration files) are managed through a web based editor now. Template development and customization is a bliss. Although it is fully transparent for users, the app now runs in an OSGI container. OSGI provides modularity, isolation and lifecycle management for apps. Its primary goal is enabling apps to be installed, uninstalled, upgraded, started and stopped any time without stopping and restarting Jira itself. Hello Zero Downtime! This version also introduces a new Agile report template, which exports Burn Down charts, Velocity Trend charts and some other key agile metrics for printing (sample PDF). It can be used with or without GreenHopper! As written above, the app packaging is moved to a more modern approach with this release. Migrating to 2.0.0 requires the complete removal of the previously installed app version, and re-installing the new version (in a more convenient way). Don't worry, this remove-and-reinstall is a one-time process. Future app versions will upgrade smoothly using Jira's standard app upgrade mechanism. The list of the upgrade steps may seem a little overwhelming first, but it is rather trivial, in fact. The only reason why this list is so long is that we give you really detailed instructions here. Remove the jira-pdfview-plugin-1.8.0.jar file from the atlassian-jira/WEB-INF/lib directory. Move the jira-pdfview-plugin.properties file from the atlassian-jira/WEB-INF/classes directory to some other folder, as you will need it soon. Move the fop-config.xml file from atlassian-jira/WEB-INF/classes to some other folder, as you will need it soon. If you made no modifications in this file, then you can safely remove it. Move the atlassian-jira/WEB-INF/classes/templates/plugins/pdfview directory (which contains your templates) to some other folder, as you will the files in it soon. If you have no custom templates or made no customizations in the original templates, then you can safely remove the directory. Make sure that the "PDF" links disappeared from the "Views" menu both in the Issue Details screen and in the Issue Navigator. If it is still there then you haven't removed the app JAR, or you forgot to restart Jira. Go to Administration → License (under PDF Views). Open your jira-pdfview-plugin.properties file in any simple text editor, and copy its content to the form. Save it. Check if the Your license expires at date reflects the correct expiration of your license. Go to Administration → PDF Templates and click fop-config.xml in the file list. Open your custom fop-config.xml file in any simple text editor, and copy its content to the web-based editor. Save it. Go to Administration → PDF Templates and click the file of which you have a customized version, in the file list. If this a custom template developed from scratch, then click the Add a new resource button under the file list. Open your custom file in any simple text editor, and copy its content to the web-based editor. If this is a custom template developed from scratch, enter its filename, too. Script execution: replace the full filesystem path of the script file with its filename only. Dispatching and inclusion: replace the #parse macro calls with $include tool calls. and do not forget to pass the first argument $ctx! Save it, and migrate all other custom templates like this, one by one. This requires little modifications in the app JAR file. To extract the app with unzip, please follow the appropriate section in the development guide. Replace the full filesystem path of the template with its filename only. Re-build the app JAR with the zip tool, as written in the development guide. Re-upload the modified JAR through the app manager. Check if your customized or newly added views work correctly both in the Issue Details screen and in the Issue Navigator.